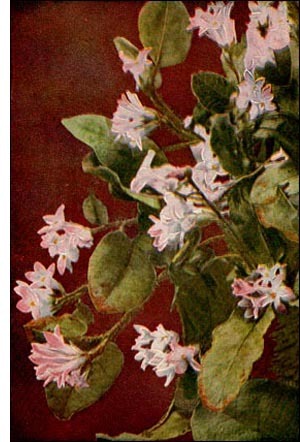 The Trailing Arbutus belongs to the Heath family and constitutes the only species of the genus. Like the partridge berry, which is often associated with it in pine woods and sandy soils, it is still in a state of transition, although it has been developing for centuries. As a rule, plants have the stamens and pistils in the same blossom, or part in one and part in another. The May-flower, however, does not carry out this arrangement. Either the antlers or the stigmas are abortive or partially so, or, in other words, the perfect stigmas are usually associated with abortive antlers, and vice versa. In this manner nature has wisely provided for cross-fertilization, which is accomplished largely by insects, as the structure of the plant is not adapted to wind fertilization. The chosen agents for this process are honey bees and a few early moths and butterflies, to which the nectar is served by this beautiful Hebe of the spring and who carry the pollen from one flower to another.